My Vienna-born husband imbibed a passion for opera with his mother’s milk and I did not always share his enthusiasm. I loved the music but was turned off by the dated, unlikely stories. I found it difficult to bridge my physical distance from the stage and hated the astronomically high admission tickets. In 2006, Metropolitan Opera director Peter Gelb initiated HD simulcast transmissions. During its first season the Met transmitted one opera to seven cinemas. The 2013-14 season includes hundreds of venues in sixty-four countries. The HD performances converted me. I love the images and close-ups of the larger than life performers, though I miss views of the overall stage. The acoustics are perfect and the subtitles easy to read. The intermission interviews with performers and others make me feel part of the production. Recently, as a special treat, we attended a new production of Die Fledermaus (The Bat) by Johann Strauss II, the Valse King, at the Met proper. The story of the operetta, a true ancestor of America’s musicals, is a farce is best summarized as a humorous revenge. A year earlier, Gabriel von Eisenstein had seen to it that his inebriated friend Falke, costumed as a bat, awoke on the streets of daytime Vienna. Today nobody would blink at his strange appearance, but 115 years ago this was a major offense. Falke’s planned revenge involved a prison sentence for Eisenstein, a jailer, an incompetent lawyer, mistaken identities, false arrests, a super-rich Russian count bored by life, and almost-consummated affairs committed by a happily married couple. Strauss’ music is captivating, the singing superb, the costumes luxurious, and the dancing stellar. For me, going to the opera house, whose history I investigated while writing America’s Medicis: The Rockefellers and Their Astonishing Cultural Legacy, was also special. The Met’s home is closely associated with the Rockefellers. Already in 1928 the opera, stuck in its old building (nicknamed the Yellow Brick Brewery) located near Times Square, wanted to move to a two-block midtown site belonging to Columbia University. It successfully approached John D. Rockefeller Jr. to help it develop a financially viable plan for a spectacular new opera house. After the 1929 stock market collapse, the opera company bowed out, and Rockefeller, now responsible for the lease of the land, had to develop the risky building project single-handedly. Rockefeller Center eventually became an urban and commercial success. 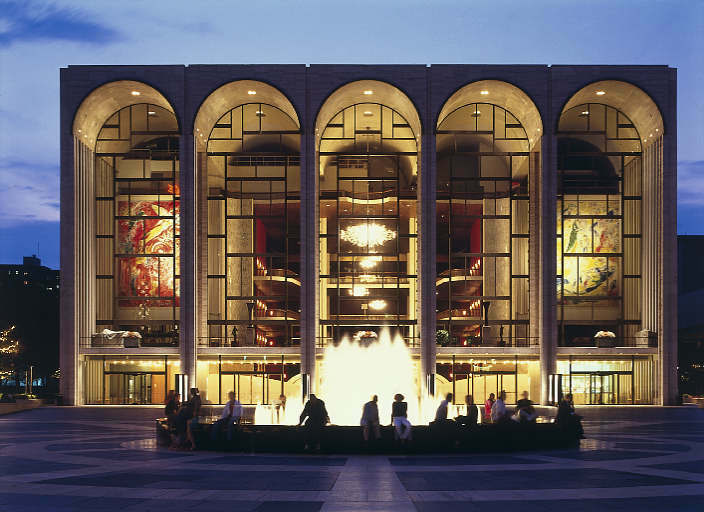 The opera remained on 39th Street for another thirty years until the development of Lincoln Center under the chairmanship of John D. Rockefeller 3rd. Wallace K. Harrison designed the opera house that aged well. Unlike Avery Fisher (Philharmonic) Hall and the David Koch (State) Theater, it has never undergone a thorough renovation. With its 2,563 red velvet covered seats, its superior acoustics, its scores of Austrian crystal chandeliers, New York’s opera house delights both traditionalists and modernists. Thanks to HD, its red-and-gold interior is now enjoyed by the entire world. Aside | This entry was posted in Uncategorized and tagged die fledermaus, hd opera, hd simulcast, johann strauss II, john d. rockefeller 3rd, john d. rockefeller jr, lincoln center, metropolitan opera, metropolitan opera house, metropolitan opera live in hd, new york, new york city, opera, peter gelb, rockefellers, the bat, the met live in hd. Bookmark the permalink.